What Does the Ear Do? The ear is designed to hear sound, with the most important sound for humans probably being speech. However, non-speech sounds are also important to help us understand our environment and for safety. Think about not being able to hear your telephone ring, crosswalk signals, car horns, the ‘back-up’ beep on commercial trucks and your baby cry. Another activity that is important for day-to-day living includes ‘localizing’ sound. Does it matter where the car or truck horn is coming from? Usually it does, so people know where to look and how to avoid an accident. 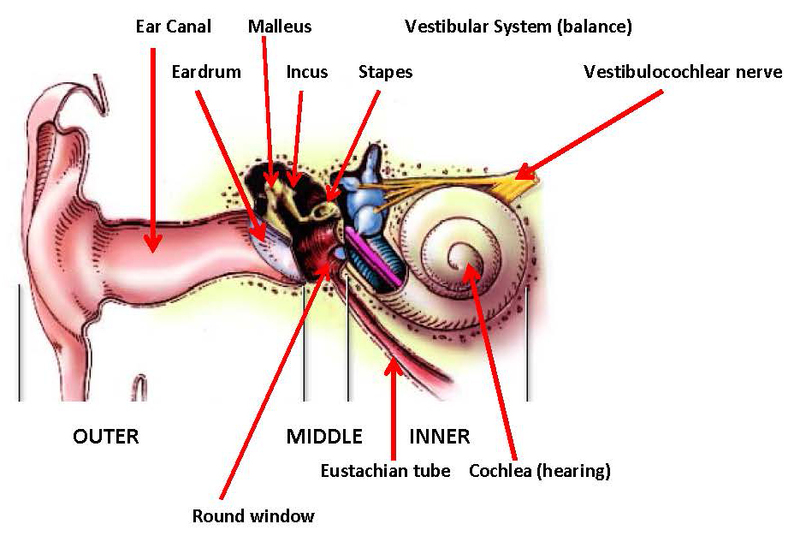 The auditory system has a big task and it is complicated and elegant all at the same time. The sound must get from outside the head to our brains. The following are different types of energy that travel through the ear to make hearing possible. 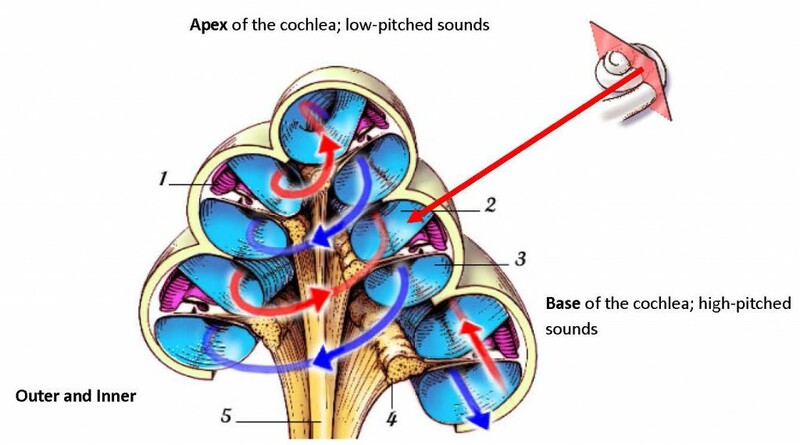 Acoustic energy, in the form of sound waves, is channeled into the ear canal by the ear. Sound waves strike the eardrum, causing it to vibrate (like a drum) and changing the acoustic energy into mechanical energy. 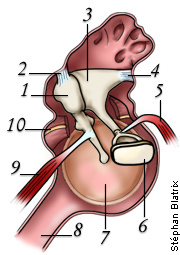 The malleus (bone), which is attached to the eardrum, starts the ossicles into motion. The stapes moves like a piston in the oval window of the cochlea creating a mechanical-hydraulic energy. The fluid movement within the cochlea causes membranes in the cochlea to move against some particular cells. This movement creates an electrochemical signal which is sent via the auditory nerve up through the central auditory nervous system to the brain, where sound is interpreted. The outer ear is made up of the pinna or auricle, that is, the visible piece on the outside of the head, and the ear canal, which ends at the tympanic membrane or eardrum. The auricle’s job is to literally collect and funnel sound to the ear canal for further transmission. The auricle also helps localize sound sources, especially helping people figure out if a sound is in front of them or behind them. Fact: Humans are very good at knowing whether sounds are to their left or right, and pretty good at front versus back. However, they cannot determine height of a sound very well. The second piece of the outer ear is the ear canal. The ear canal is about 1¼ inches long and has an “S” shape, but everyone has some variation even between their own two ears. The outer 1/3 of the canal is like the rest of the body, in that it has skin over cartilage over bone. In addition this region is lined with ceruminous (wax) glands, sebaceous glands (sweat glands) and small hairs. Everyone produces ear wax and the wax and hairs have a couple of purposes. First, the wax and hairs in the canal are designed to keep out things that shouldn’t be there, such as bugs. Most bugs don’t like the composition of the ear wax and thus do not enter the canal. Second, the wax and hairs are designed to move any debris that does get into the canal out of the canal. Many have probably heard that people should not use cotton swabs. The reason for this warning is that instead of getting wax out of the canal, most people unknowingly shove the wax deeper in. If wax builds up deep in the canal, deeper than the outer 1/3, there is no mechanism to move that wax out of the canal and the wax can cause temporary hearing loss. The inner 2/3 of the canal has a different composition: skin rests directly on bone. If someone touches an instrument to this portion of the canal, you will know it and it can hurt. By and large there is little reason to place instrumentation into this region of the canal. There are no glands and no hairs in the inner 2/3 of the canal, so if wax is pushed to this area, it likely will have to be physically removed by an audiologist or physician. The area where the ‘cartilaginous’ and ‘bony’ canal regions meet is called the osseocartilaginous junction. It happens that this ‘junction’ sits just under the mandible or the jaw bone. When the mandible overrides its normal position, it can apply pressure to this junction and contribute to temporomandibular joint disorder or TMJ disorder. Pain caused by this pressure can be perceived as pain in the ear or otalgia. The auricle and ear canal have another job that is important for speech understanding. This job is that they act like a filter to emphasize information in the speech frequency region, making it easier to understand speech. The final portion of the outer ear is the eardrum. This membrane is thin but tough, being composed of three separate layers of material. Closest to the outside of the head is skin that is continuous with the skin of the ear canal; the skin on the eardrum is much thinner, however, and we can see through the drum. The middle layer is fibrous tissue that comes in two varieties: radial and concentric. The radial fibers are like bicycle spokes, from center to edge, while the concentric fibers are circles. These two types of fibers are interwoven, providing the toughness of the drum and making it resistant to punctures and damage, although it can be injured. 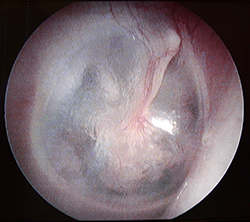 The inside layer is mucous and is a continuation of the lining of the middle ear space. This is an eardrum with the cone of light showing. This is a sign that the eardrum and system are normal. Movement of 1 billionth of a centimeter is sufficient to be heard by someone with normal hearing (this is the width of a hydrogen atom!). The middle ear is a space that is normally filled with air that is a bit larger than an aspirin tablet. In the ear diagram below you can see the middle ear space, the ossicles, or the three ear bones, which are named the: malleus (hammer), incus (anvil) and stapes, (stirrup). See a diagram of the middle ear derived from www.neuroreille.com/promenade/english/ear/fear.htm. The ossicles are the smallest bones in the human body and all three bones can fit on a dime with space left over. The Eustachian tube travels from the middle ear space to nasopharynx (throat) and is lined with mucosa. The Eustachian tube has three functions: equalize pressure with that outside of head; provide oxygen to the middle ear space so the tissue can function; and clear fluids out of the middle ear space. When the Eustachian tube isn’t working correctly, a person can feel stuffed up or might develop an earache. Allergies, upper respiratory infections as well as other causes can block the Eustachian tube and cause ear symptoms. The middle ear has a critical role in hearing by moving the sound energy from the outer ear (acoustic energy) to the inner ear (fluid or hydraulic energy). This transformation is hard because 99 percent of the acoustic energy will bounce off the surface of a fluid and not enter the fluid. Anytime energy moves from one type of medium, such as air, to a different medium, such as liquid, part of the energy is lost due to an impedance mismatch. Impedance can be defined as resistance to the flow of energy through a medium. Every medium has a different energy flow — impedance in air is low but in fluids is high. Think about the swimming pool game of Marco Polo. The person who is “It,” with eyes closed, says “Marco.” The other players with their head above water have to respond “Polo.” This helps the “It” person to localize where the other players are and tag them. People with their head and ears cannot respond because they didn’t hear “Marco.” That same phenomenon is going on in the ear all the time and the ossicles are what help transition the sound from air to fluid. If people did not have the middle ear and the ossicles, we would lose about 35 decibels of sound. Thirty-five decibels is about the level of a soft whisper at six feet. With the ossicles humans are able to recapture or maintain about 30-33 of those decibels, which means that we can hear much softer sounds than we otherwise would. The inner ear lies in a hollowed out portion of the temporal bone, the hardest bone in the human body. The ‘labyrinth’ is a system of interconnected canals that make up the inner ear. The outer labyrinth is called the osseous or bony labyrinth (orange in the diagram) and is filled with a fluid called perilymph. The membranous labyrinth (blue in the diagram) is housed completely inside the bony labyrinth and is filled with a fluid called endolymph. See 3D pictures of the models of the ear at this Harvard website. In the top right cartoon the inner ear structures are in light and dark pink; the ossicles are dark blue. The inner ear is made up of two pieces, the vestibular organ and the organ of hearing, the cochlea. The vestibular organ is made up of three tubes that sit at right angles to one another. This orientation is important because it allows people to feel any rotation their bodies or heads make in any direction. The utricle and saccule help them know when they are moving in straight lines, front/back, side/side and up/down. In reality all five of these motion sense organs are working at the same time, just in different amounts, depending on how people are moving in space. The vestibular system works with the eyes, and there are eye reflexes that occur when people turn their heads. The vestibular system and eyes also with the proprioception system. Proprioception refers to the information we get from tendons, ligaments, muscles, etc. that tell people how they are positioned in space. All three of these, vestibular, eyes and proprioception, make up the balance system. Audiologists perform tests on the balance system to help diagnose balance problems. As you might suspect, balance problems can be quite debilitating, limiting mobility for the affected individual. The balance system, then, is made up from the vestibular system in the inner ear, the eyes (and all the wiring in between these), as well as the proprioception system. 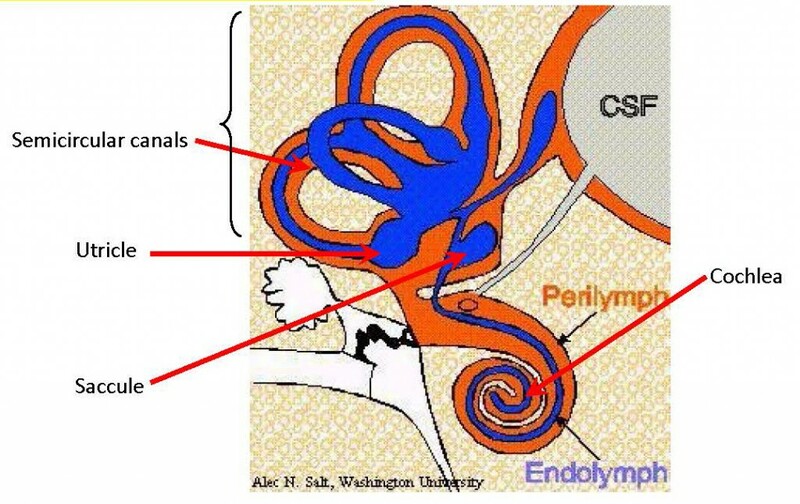 There are about 20,000 ‘outer hair cells’ and 3500 ‘inner hair cells’ in each cochlea. The outer hair cells are critically important for hearing because they actually move and help amplify very soft sounds so humans can hear them. This amplifying action also creates something called ‘otoacoustic emissions’ (OAEs), discussed in a separate module. The auditory system is the only sense system in which sensory cells, that is, cells designed to pick up information from the environment, can move in response to an incoming stimulus. 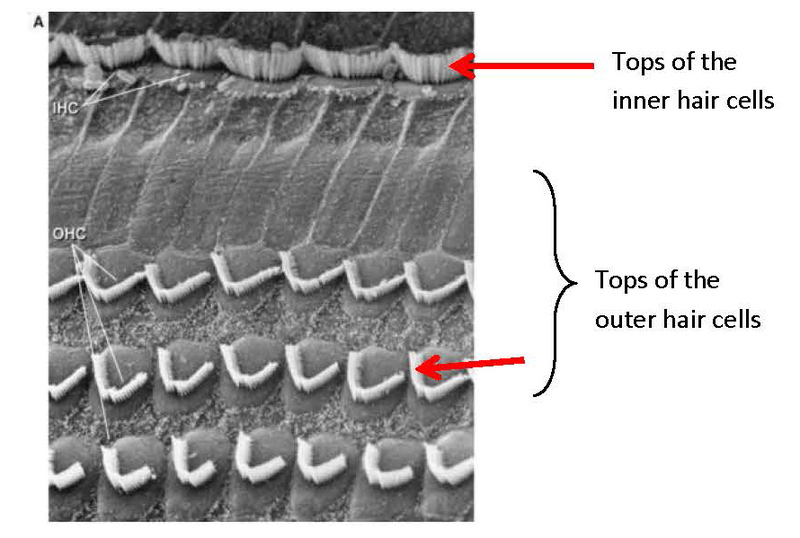 The inner hair cells are important for hearing because they ‘transduce’ sound, that is, they convert the sound into neural impulses that are sent to the brain.